Do you remember the ice cream truck? In my town it was the ice cream bike. Kids would ride around town on bikes with freezers attached to the front, ringing their bells to let us know that they were coming with some cold and creamy treats. One of my favourite things from the ice cream bike was the chocolate dipped ice cream cone. 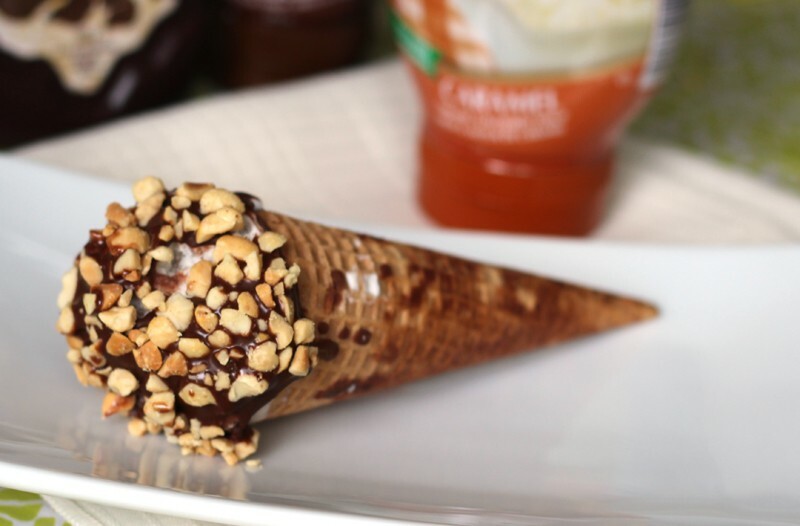 It is still one of my favourite ice cream treats available on ice cream trucks today, and using a variety of ice cream toppings, I was able to create my own chocolate dipped ice cream cone to have at home. I filled the cones with a chocolate coating that hardens with it gets cold, coating the sides before placing it in the freezer. 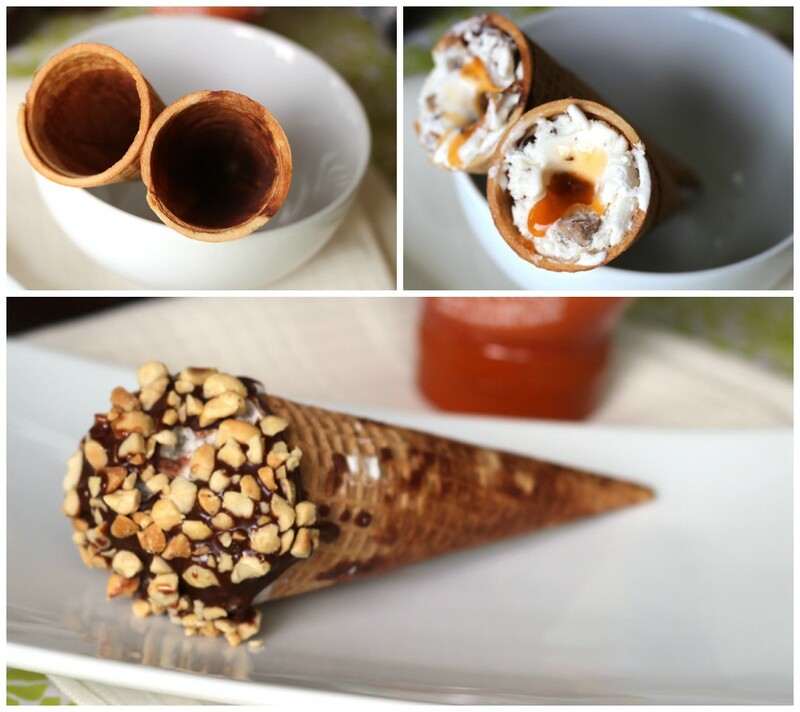 Then I filled the cones with ice cream and hollowed out a spot in the middle to fill with caramel. I added more ice cream and dipped the cone in the chocolate sauce that hardens. Here’s a tip: Don’t turn it right side up before the chocolate hardens, or you end up with chocolate all over the cone! I finished it off with some chopped peanuts and I successfully recreated my favourite ice cream treat! My husband’s favourite ice cream truck treat is an ice cream cookie sandwich, and I knew I could easily recreate that. I added a little extra sweetness by putting a swirl of chocolate sauce on one side of the ice cream and caramel on the other side and simply put the sandwich together. These turned out even better than the kind we used to buy off the ice cream truck! What was your favourite treat from the ice cream truck? Have you ever tried to recreate it at home? I have never tried to make them at home, but it does seem easy enough! Thanks for the idea, will have to try doing this! Does that ever sound so delicious! This would be a great idea for a little backyard party! That is so cool! We have made our own ice cream but never tried to make our own ice cream treats, thanks for the idea! These look so darn tasty! 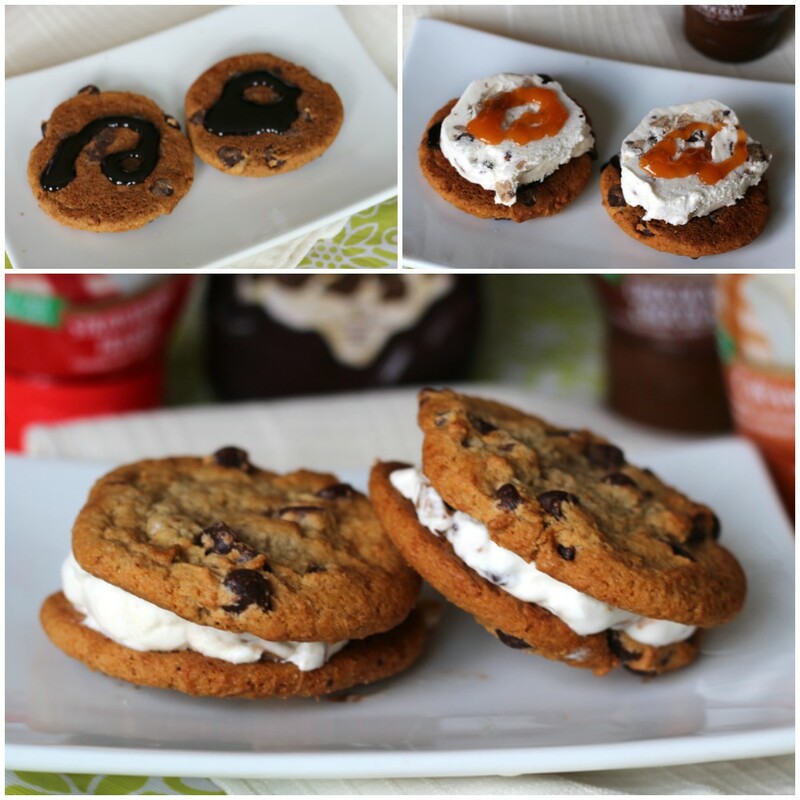 These are brialliant,thrifty and easy!Thanks for sharing! We love ice cream and ice cream treats in our house. Thanks, will be trying these for sure! These look incredible. Would be great for any summer themed party BBQ or heck any day. Very Fun! Thanks for sharing..
Yum, those look GREAT! Our ice cream truck comes by a lot since we have tons of kids in this neighborhood. But the prices nowadays are outrageous! This would save some cash for sure & still be delicious. Wow, how do you think of these recipes? I browsed this one just in time for the hot, humid weekend they are forecasting. Thank you for sharing. I am going to make the ice cream sandwiches, but am going to use an old fashioned oatmeal cookie. I love the addition of the chocolate and caramel sauce that you did. 🙂 As a kid, I always got a swirl cone….guess I couldn’t decide between chocolate or vanilla. Although I do remember as a young child, my mom used to ask us if we wanted white ice cream or vanilla. lol. I have to try this!!! OMG! This is my ultimate dessert because it’s got my 2 favorite things ice cream and cookies. Yummy ! These look like fun! And so simple too! Delicious! They look good and easy enough to make. I love drumsticks. I never thought of trying to make then myself but will try these once summer returns. I have never made these type of ice cream treats at home. I always buy them. I’d love to make them with my boys.